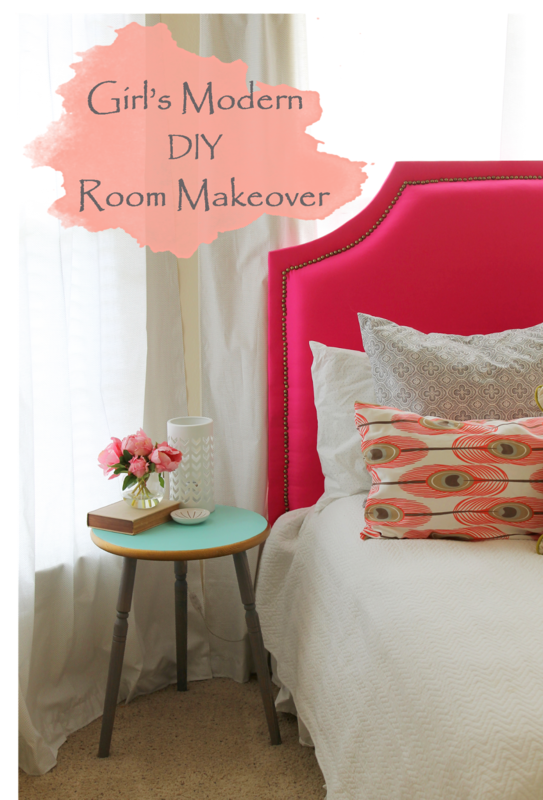 I'm super excited to show you today's "Girl's Modern DIY Room Makeover". This fun space is my daughters new room, that I surprised her with for her 13th birthday in January. 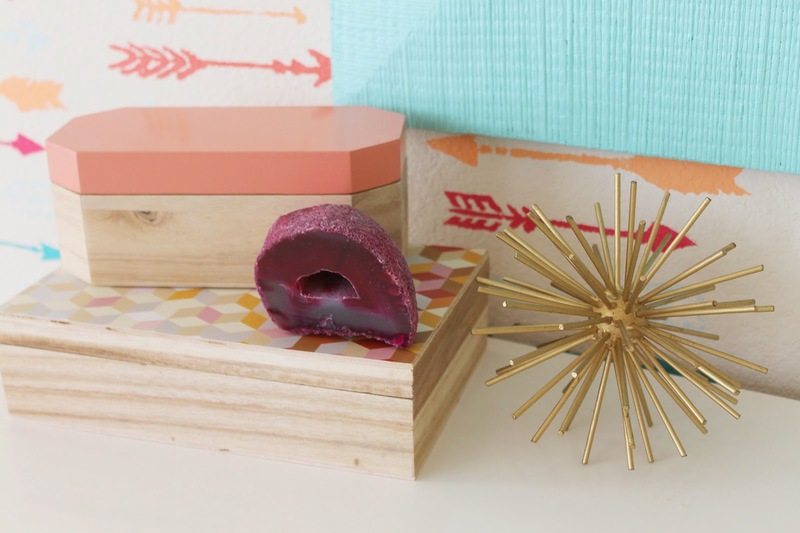 This room is so super budget friendly, and filled with all sorts of DIY, and how-to's. I even have an awesome give away from Cutting Edge Stencils coming this week!!! As I had mentioned to you recently, my husband work was taking on a move across the country. Which meant we had to put our house on the market, and it sold in 24 hours! I was sad and excited, as I packed up the house and made plans to meet up with my husband who had moved in May. Unfortunately, things didn't work out quite like we had hoped on my end, and so I was forced to move into an apartment temporarily. I have lived in apartments before, when I was younger, and always hated that temporary feeling of it. It's a hard placed to call home, when you can't do much to turn it into your home. Most all the apartments I have ever lived in, did allow you to paint, as long as you painted it back. So I always painted something. Alot of people would just leave it alone, and live with the color to avoid the stress of painting and re-painting...and I totally understand that too! 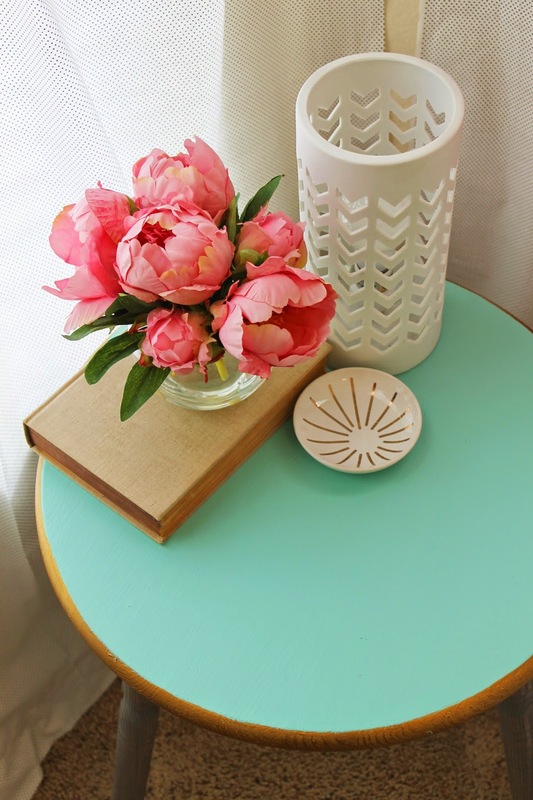 So, coming up I will start showing you easy tricks, and budget friendly ideas to making an apartment, or any temporary space....feel more like home. 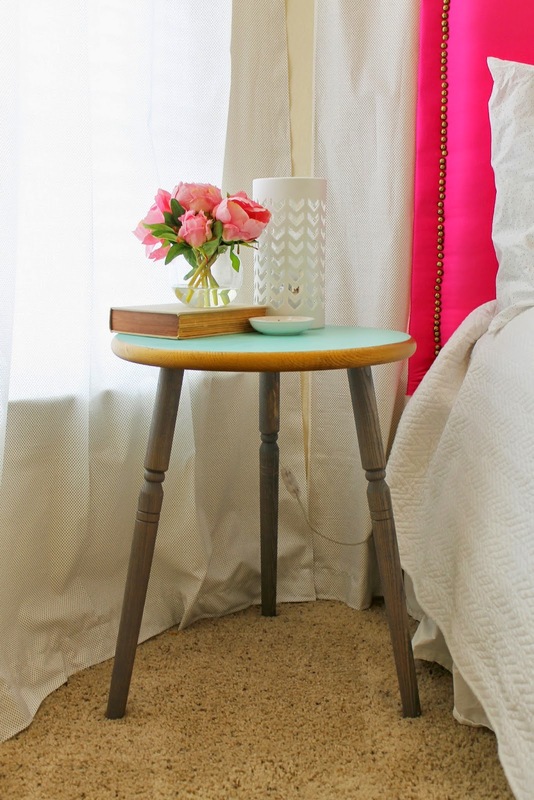 These ideas are also great for any type of small space. You have to work with what you have, so why not get the most bang for your buck!! You can see here in this picture below, just how small my daughters room actually is. It was a very awkward shape as well, forcing the bed to go right where it is. The box shape of the room, was cut off by an angled wall, which made it difficult to fit even a desk, since it would interfere with traffic flow. Over the next week I will be posting how-to's on all the project's in this room. 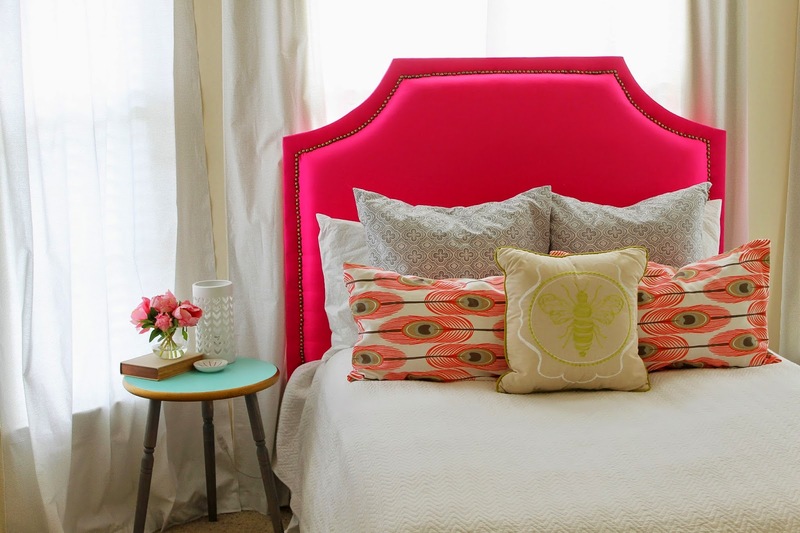 One of my favorites, is this upholstered headboard. I only ended up spending $75 to make it! It was a quick and easy project, that is totally customizeable. 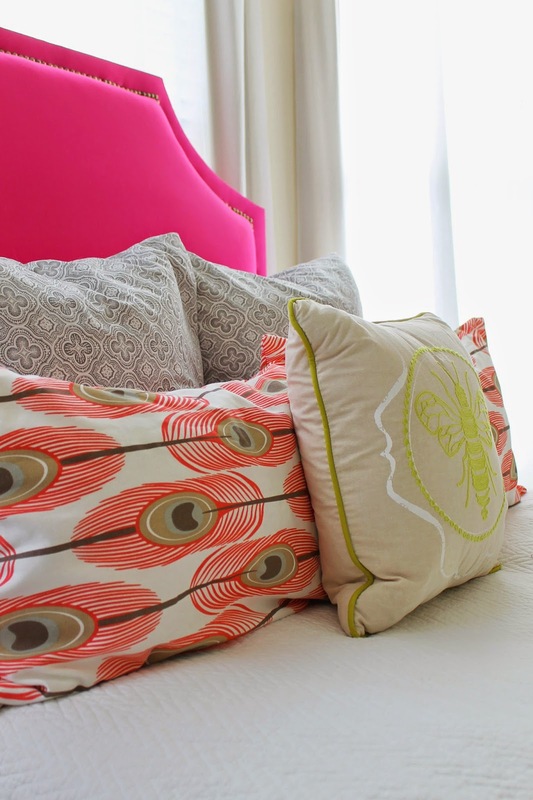 I also custom made the pillows, to bring in several different patterns and sizes. 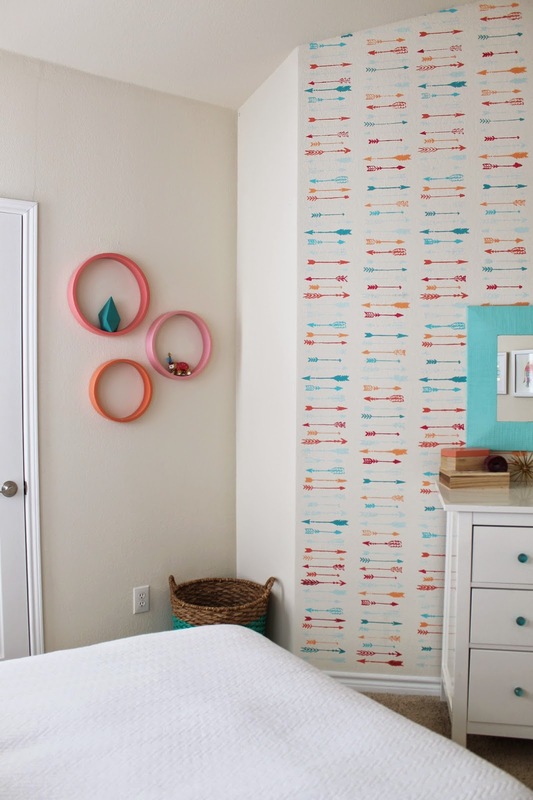 When going with a modern, and colorful theme like this, you really need the room to flow but be mixed together. 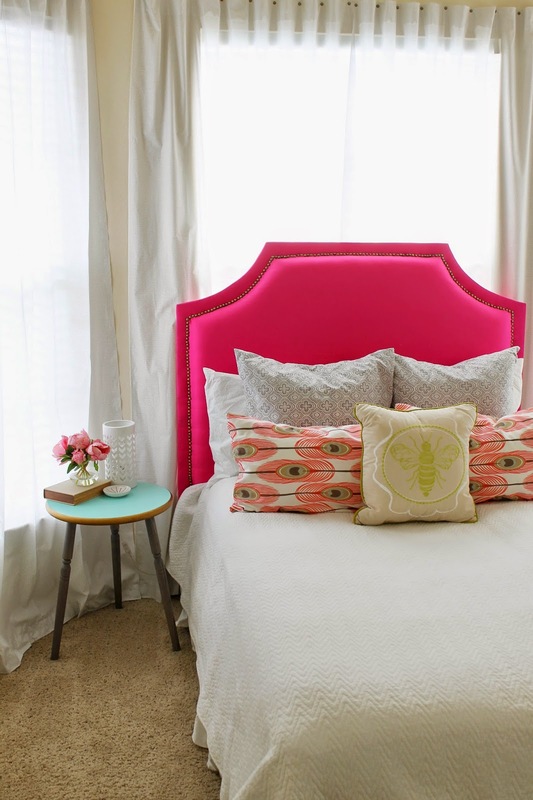 All of the fabrics, including the pink on the headboard, curtain panels, and pillows are from Hobby Lobby. All purchased during a big sale for under $100, for everything. The bee pillow was on clearance last fall at Target. 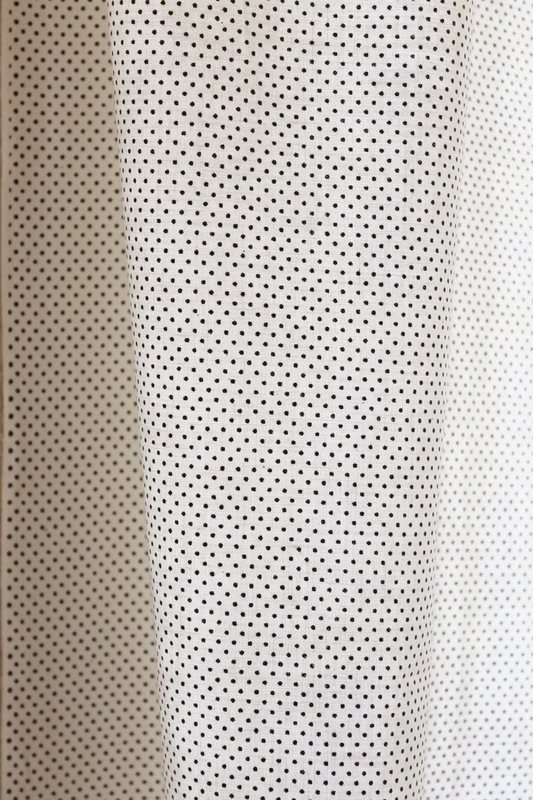 For the curtain panels, I just bought 11 yards of white fabric, with irregular black polka dots. Normally I would sew these, and add a black out fabric to the back. But I didn't want to put in the extra cost If we would be moving, and may not need this size, or amount of panels. 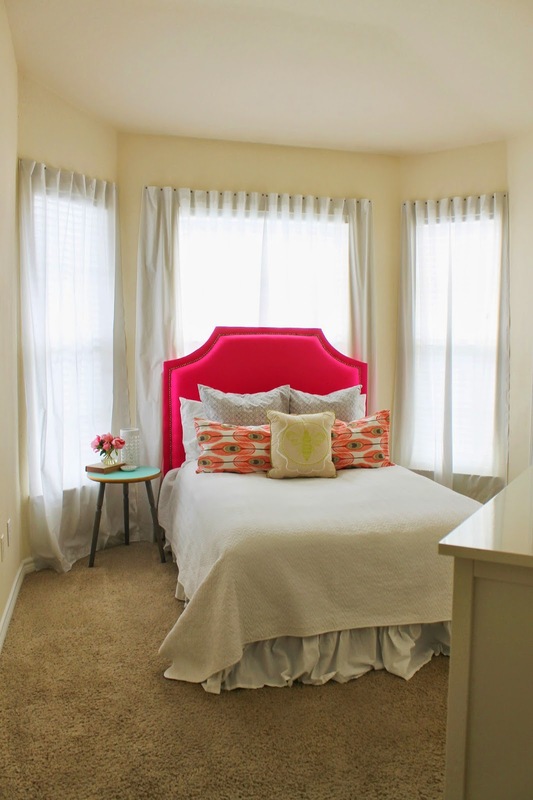 I also opted not to buy curtain rods since her room would need three. You could use the basic bracket kind, since these panels are always in this position. 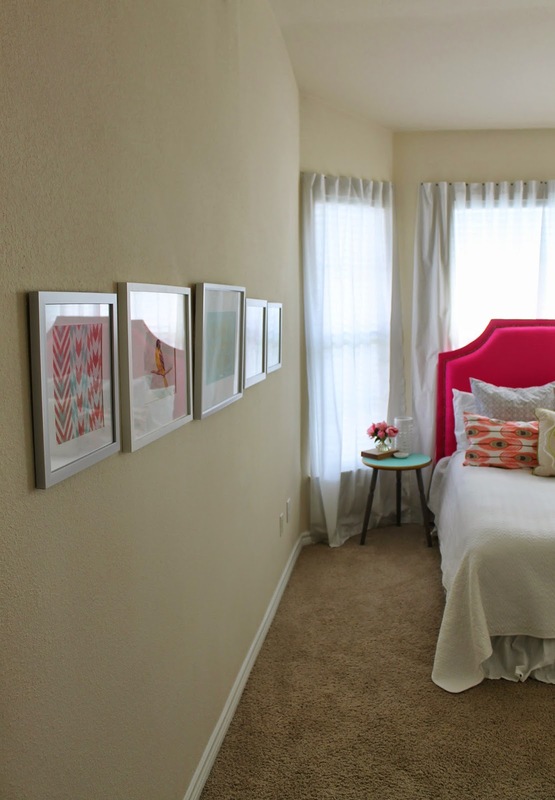 But I chose to use metals tacks to hang them, which tied in with the headboard. 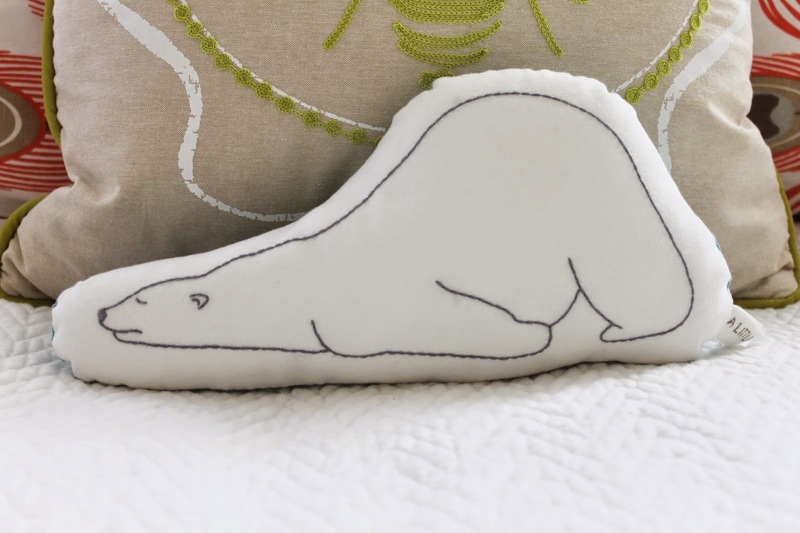 Since she loves polar bears, I found her this Sleepy Polar Bear on Etsy, made by A Little World. 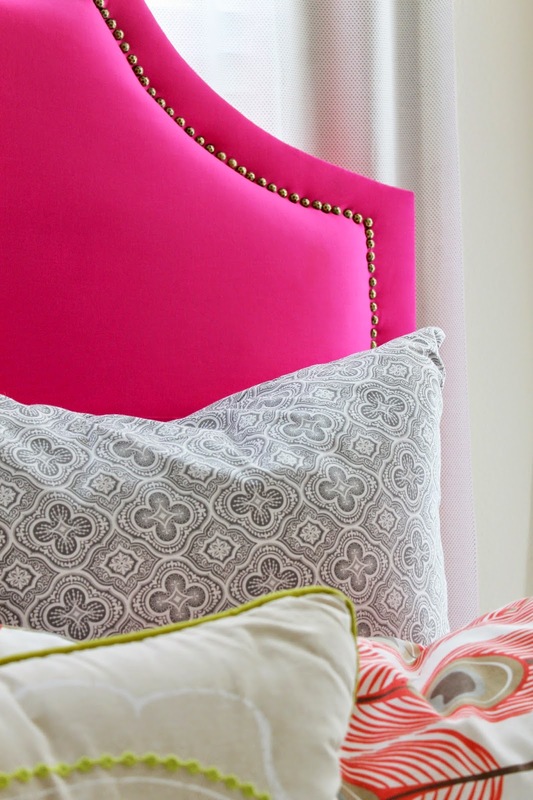 They have all sort of sweet little pillows, to match any theme or decor! Since space was an issue, I decided to make a side table, so I could customize it. This table cost less than $32 to make. I will show you where to get your supplies, how to make it later this week. 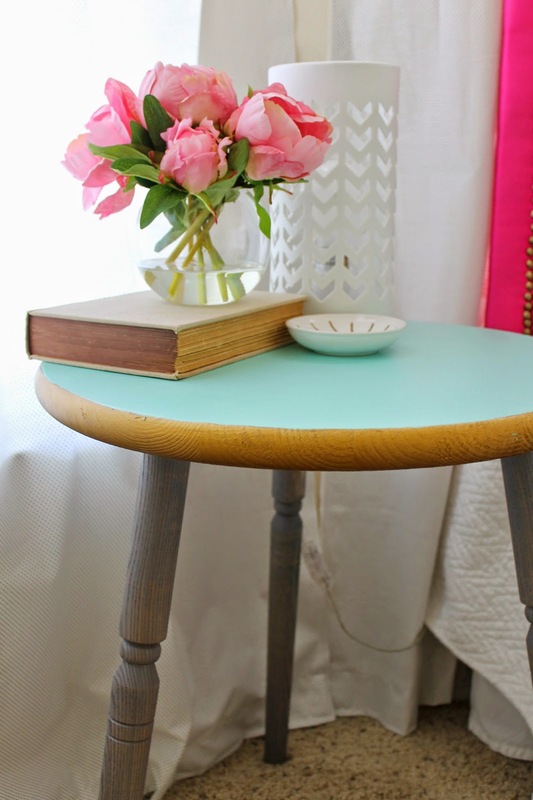 This colorful table is just the right size for a few things, which helps cut down on all the clutter that a teenager can create. The porcelain lamp was used from my other daughter's old room, and originally came from target. It's really fun lit up at night, it casts cool shadows on the walls. Since clothes actually finding the laundry basket inside the closet, seemed to be a major issue.....I chose to have it front and center...no excuses. 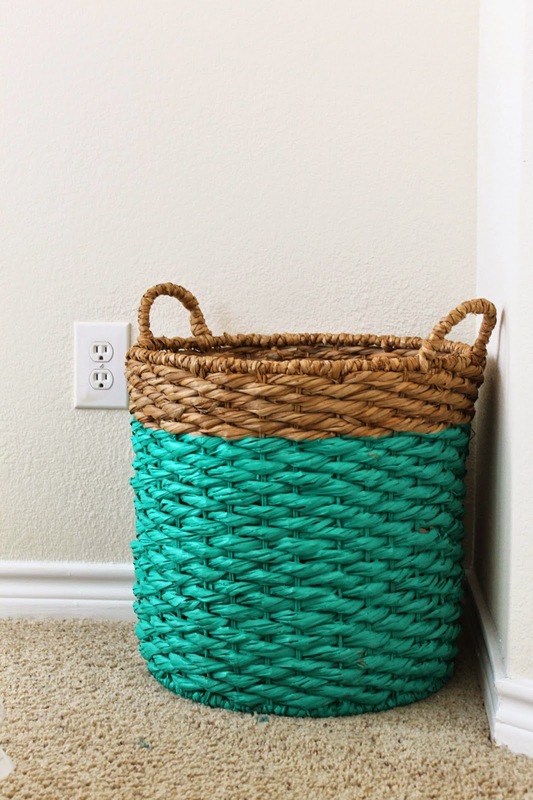 Laundry baskets aren't super pleasing to look at, so I chose to use a large floor basket with handles. This also ensures that the laundry gets done frequently as it won't hold alot of clothes. There is a method to my madness!! 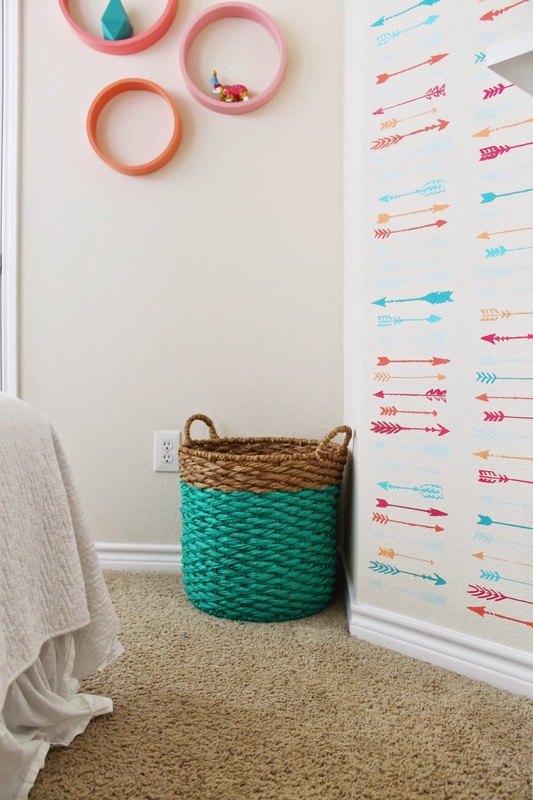 I painted the bottom portion of the basket, to blend it to the rest of the room, and add a punch of color. A simple fix, and I'll show you how. 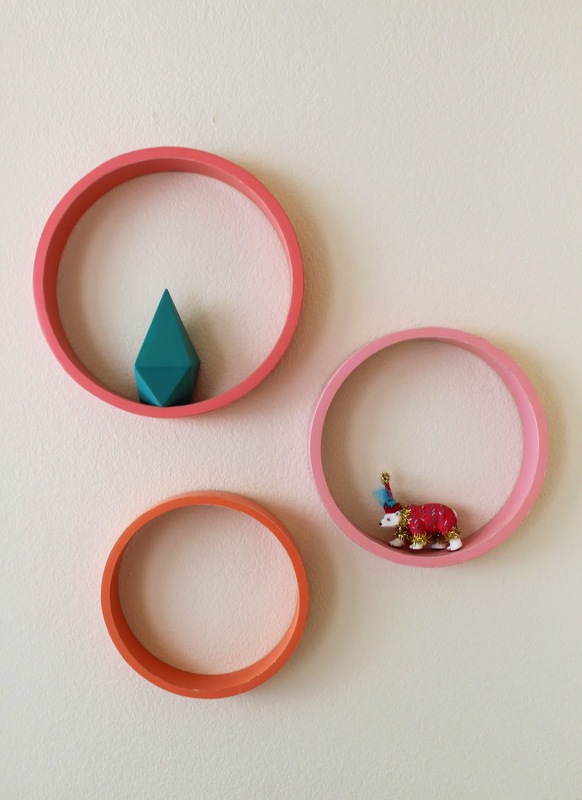 These 3 dimensional wall shelves came from Hobby Lobby (during a half off sale, yippee). Her birthday cake topper I made her was the perfect size to be displayed. You can find more little guys like him in my shop on Etsy, Painted Parade. This weird angled wall, was the real problem area of the room. The bed stares right at, and the walls are actually very tall in here. I was not about to paint this whole room, and then paint it back at the end of the year. But this small section, was much more doable for me. Keeping it on the existing wall color will save some time as well. I ended up finding a really fun arrow stencil at Cutting Edge Stencils. It was a hard choice since they had 7 different ones to choose from. I chose the Indian Arrows Allover Stencil. The pattern of the arrows went back and forth, and it seemed to be less tribal, or southwestern feeling. I will be showing you the how-to for this fun treatment in a few days. 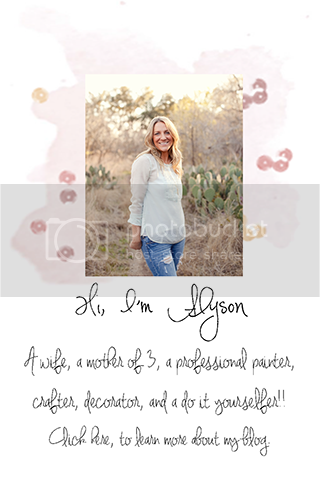 Be sure to check it out, because I'm pairing that, along with a stencil giveaway from Cutting Edge Stencils themselves!! 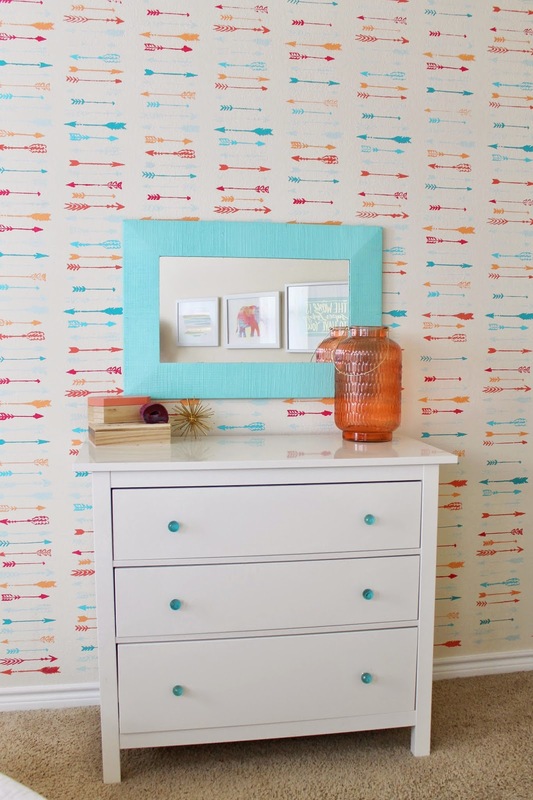 See the stencil how-to here. 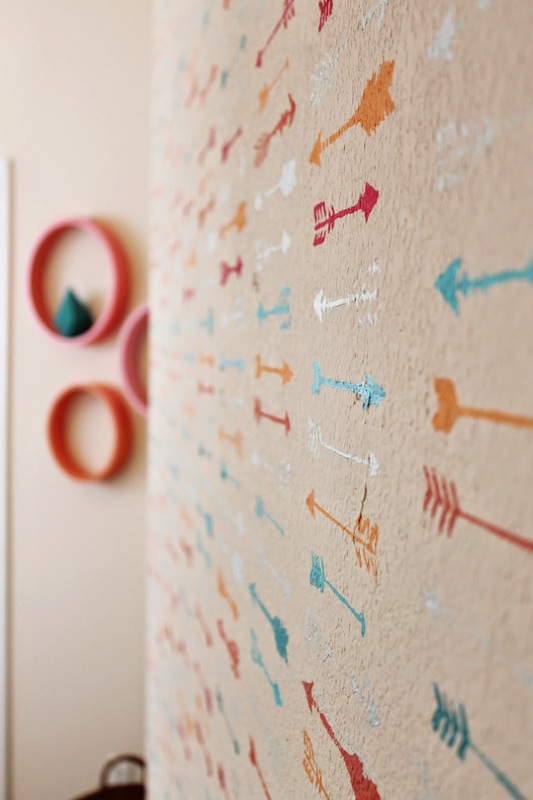 If your not wanting to doing something so permanent to the wall, you could also try doing this technique on a roll of canvas, and using it like a panel of art. It would even work on butcher block paper, just keep that away from areas that may get wet. 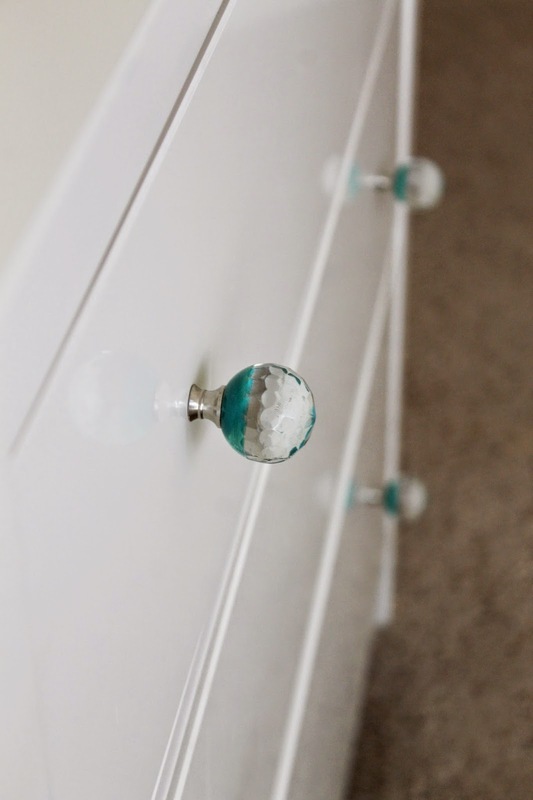 This Ikea dresser had some very basic knobs before, but I swapped them out with some painted, glass ones from Hobby Lobby. The large peach glass lantern is from....you guessed it, Hobby Lobby. Hey, you can get some good deals during their sales, and I was on a tiny budget here. 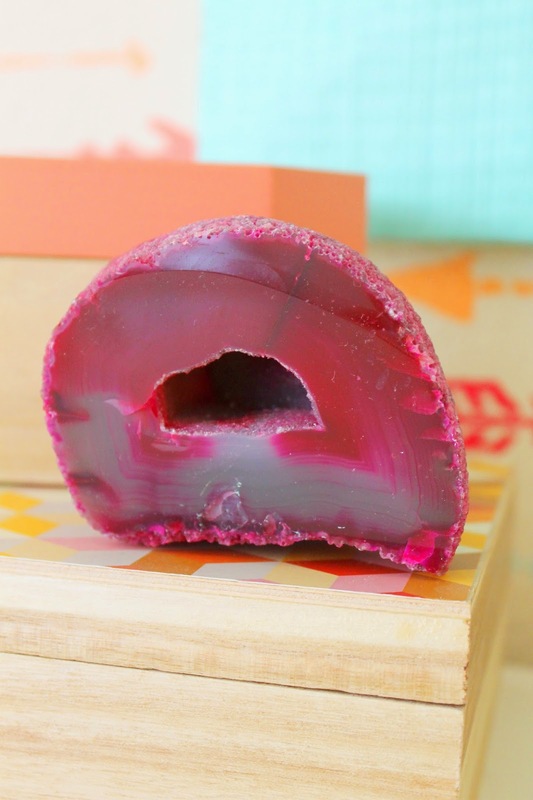 All of the counter decor (minus the geode) is also from Hobby Lobby. It was at the perfect time with the color palette they were pushing!! I wanted to mix in the bit of gold, here and there around the room. This fun spikey ball is meant to hang, but I rested it on the counter instead. Love this punch of color, in something so natural. On the long, lonely wall, I added 5 pieces of framed art. Keeping them at eye level makes the wall feel, not so big. 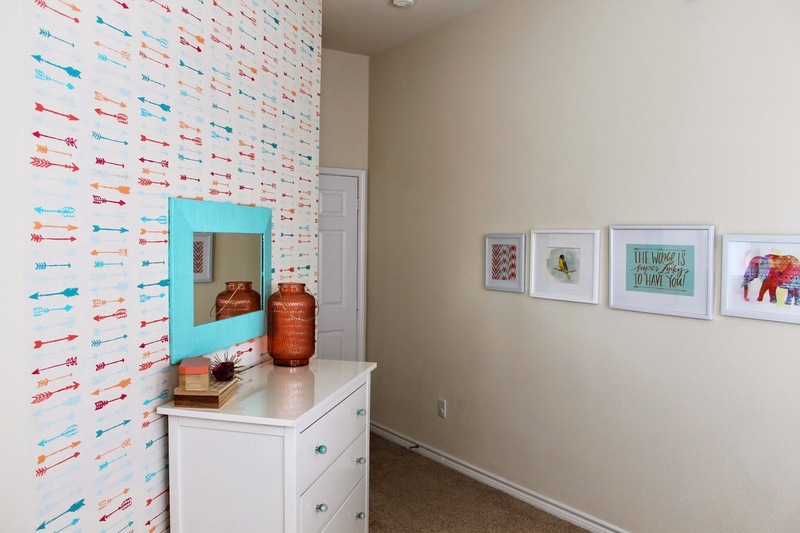 Using large pieces of art, on a wall like this will change the scale of the room. All of the things I have done in here, minus the stencil, are simple and easily moveable. If when we moved, I decided to paint all of her walls, the pieces I have added would still go since the colors are simple, and I stuck to the white. 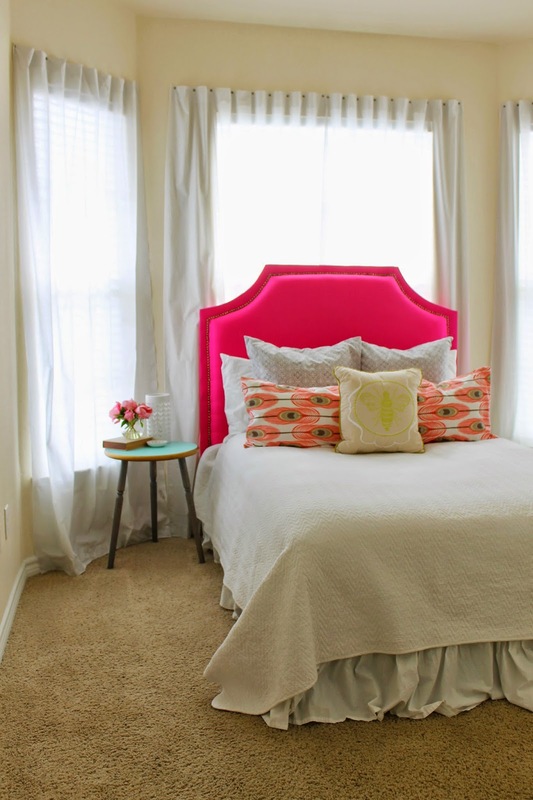 Apartment living is a place to think in neutrals, but use small pieces, paintable pieces to add your color. 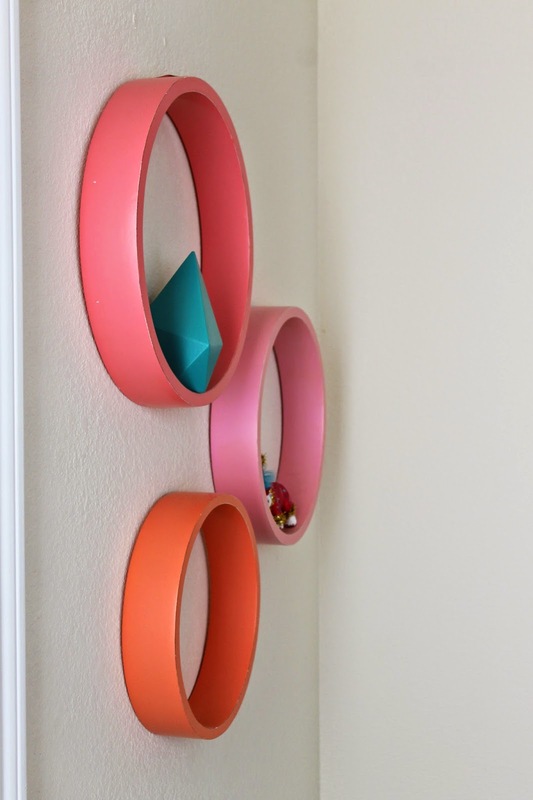 That way you can always paint them later to fit your space. 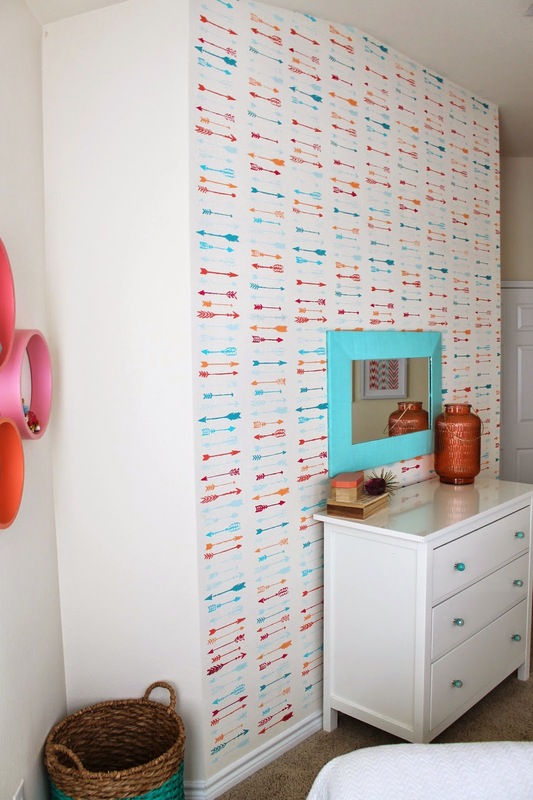 There you have it, a modern DIY girls room! All this week I will be showing you how to make or paint all the projects in this room. 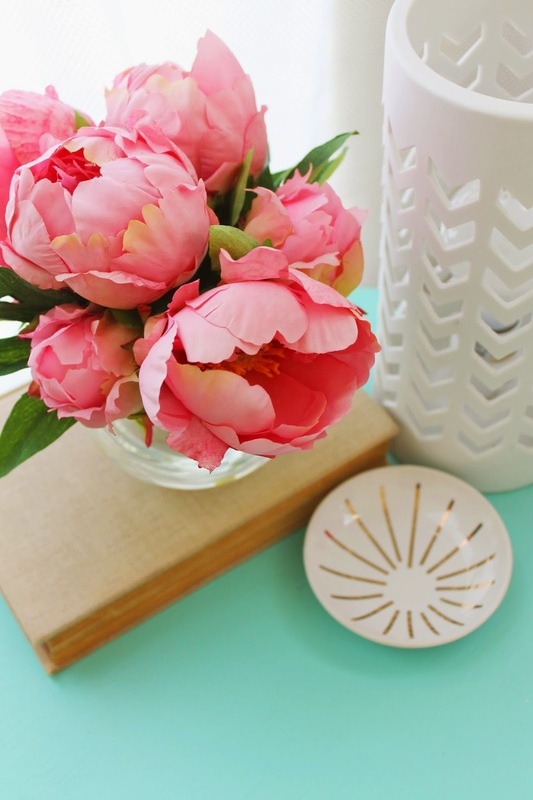 And don't forget about the stencil giveaway! Where did you get the gold spikey thing. Want one!! 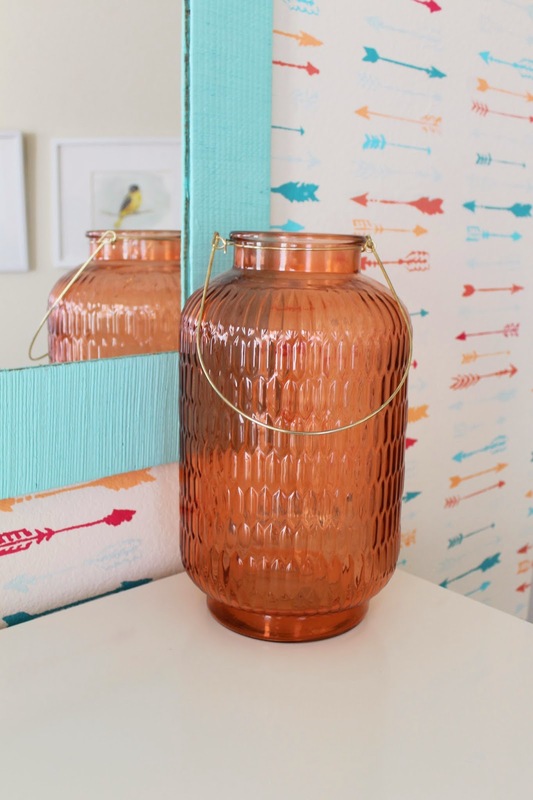 Arrow Stencil Wall & Giveaway! !